Earlier this year, A&E’s hit show “Intervention” featured Terry, an alcoholic and compulsive overeater. 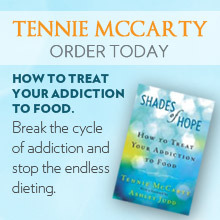 Tennie was called in to help counsel Terry and Shades of Hope was enlisted to provide treatment for Terry’s addictions and eating disorders. We asked Tennie to provide some additional background information about Terry’s situation that wasn’t included on the TV program. Here’s a link to our original blog post about Terry & A&E’s “Intervention” Season Finale, which includes many wonderful, heart-felt comments from fans and Terry’s family and friends.